The heart of any home is the kitchen and WOW what a kitchen you'll find. Upgraded cabinets, porcelain farm sink, granite countertops, lots of cabinets, breakfast bar, stainless steel appliances...the list goes on. If you are an entertainer, the open concept kitchen is the hub of the living/dining great room. Beautiful tile flooring is in all the right places & the 3 bedrooms all have new carpeting. The master bath has been tastefully remodeled & incorporates a retro/modern look. The 2nd bedroom can double as a bedroom/office as it features a queen size Murphy Bed. The Arizona room features plenty of light with a wall of windows and travertine flooring. This is a great place to enjoy your hobbies/crafts. 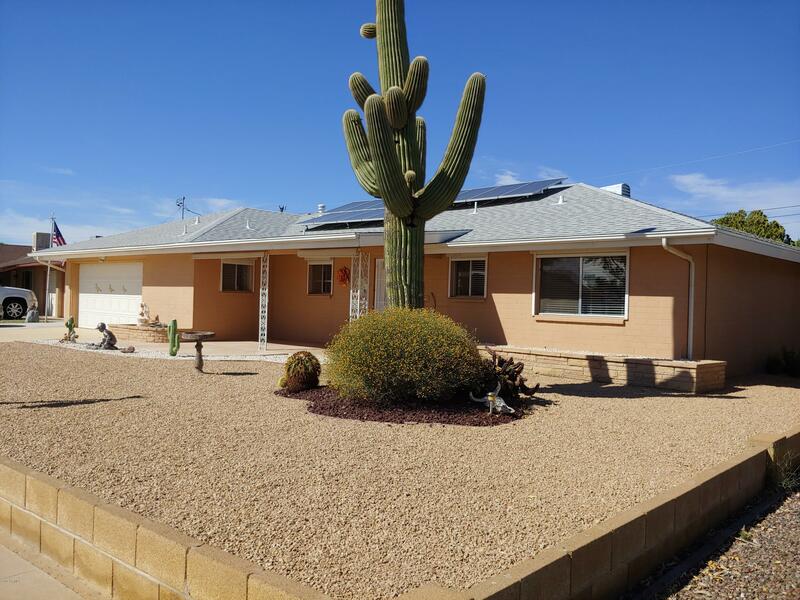 A new roof was installed in 2018 and the solar panels & system are owned. And, if you are a traveler, be sure to push the switch on the wall by the window before you leave as this will activate the exterior security roller screens. And don't forget about your Vitamin C....there's an orange and lemon tree. The two car garage is plenty spacious and has a wall of cabinets and then some! Come take a look at this gorgeous home...you will not be disappointed!